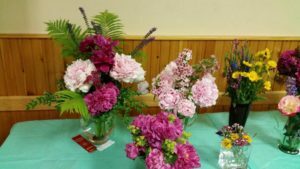 In case you weren’t able to attend the Dunnville Horticultural Society (DHS) Garden Tours, 8 members of the DHS hosted self-directed garden tours on July 10. Each garden was diverse, welcoming, and a piece of heaven. “Our 5th generation farm is set on the banks of the Grand River. It’s not unusual to see deer mingling with the horses, along with sand hill cranes and wild turkeys.” said Debbie. The Plaenksken’s vegetable garden was immaculate and weed free. I knew their vegetables were thriving because of their hard work. Gardeners are connected to the earth. Along with nurturing perennial beds and garden produce, we discovered some hosts, like Petra, made their own maple syrup and had farm fresh eggs for sale. Although the sun was hot overhead, we were welcomed to the breezy, carefree garden of the Zynomirski family along the shores of Lake Erie. It was the perfect ending to an inspiring day of garden tours. There is always something interesting happening with the DHS. On August 13, we will enjoy a “Botanical Gardens and Winery Tour” organized by Deb Zynomirski, Vice President. A coach and driver from Attridge Transportation will to take us to the Niagara Parks Botanical Gardens, then on a tour of three distinguished wineries of the region: Reif Estate Winery, Southbrook Vineyards and Konzelmann Estate Winery. July is a time to sit back and enjoy our gardens. The fruits of our gardening labours are literally in our hands this month. Harvests of early tomatoes, tender peas, and fresh herbs along with bouquets of fragrant flowers fill our homes. It doesn’t matter how wet the spring was, rain can be very elusive in July. Humidity begins to peak. While there’s no definitive list of gardening chores for the July garden, gardeners just play it by ear. Here are a few tips and reminders for July gardening: be careful to avoid working in the hottest part of the day and be sure to drink plenty of water while gardening. Hats, sunglasses, and sunscreen are a must for me. Continue to stay ahead of weeds which seem to thrive in the warm weather. It’s a good idea to replace mulch in gardens as needed to keep down weeds and retain moisture. July is a good time to check garden centres for mark downs on plants and use your DHS membership card for additional discounts. Add potted annuals in places where you need a punch of colour. Keep lawns to about 3″ to protect from the summer heat. Clean bird feeders and bird baths if needed. 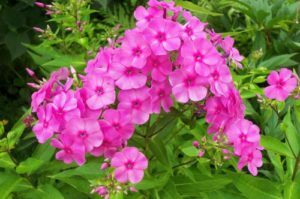 Deadheading encourages more blooms at this point in the growing season. Annuals can be cut back by 1/3 promoting new growth. Since July is often one of the hottest months of the year, make sure your plants are well watered, using grey water wherever possible. Most importantly, take time to sit back and enjoy your gardens and all your efforts. 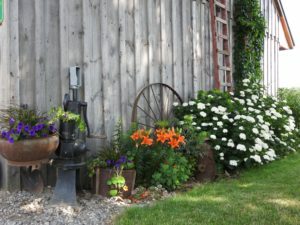 If you happen to have a few hours free on Sunday, July 10th, please join us for our Dunnville Horticultural Society (DHS) Garden Tours. We are offering 8 amazing self-directed tours. Pack a picnic lunch and enjoy a cold beverage at one of the locations along the tour. This event is free to DHS members and non-members are welcome with a membership available at any home for $10/single, $15/couple and $5/children. Call Debbie Thomas, President (905) 774-3064 for garden tour locations and more information. “Botanical Gardens and Winery Tour” occurs on Saturday, August 13, 9 am -3 pm and is being organized by Deb Zynomirski, Vice President. A coach and driver from Attridge Transportation will to take us to Niagara Parks Botanical Gardens, then on a tour of three distinguished wineries of the region: Reif Estate Winery, Southbrook Vineyards and Konzelmann Estate Winery.